Anyway, let’s deal here with one issue; namely, that of how Piketty treats the public debt. He discusses two countries: Britain and France. Both of these countries ran up massive debts in their late-18th century wars (mainly with each other!). France pretty much cleaned its slate during the French Revolution through a combination of partial default and sustained inflation. But Britain carried its debt into the 19th century. Piketty takes a sort of crude socialist view of the debt as a tax on society. He sees it — as Marx did too, mind you — as a means to redistribute money by taxing goods and services bought by workers in order to pay rich rentiers. He tells us, for example, that in Britain the owners of the debt were obtaining fairly high interest payments. I don’t really see the rates of interest in these years as being particularly high. They basically fluctuated just below the 5% mark. Frankly, I’m a bit wary of Piketty’s interpretation of the taxation system in this time period. He seems to hold a very narrow view in that he seems to think that the taxation system is merely a means by which redistribution takes place and in this period that redistribution is from poor workers to rich debt holders. While this is one function of the taxation system, it is not the only one. But in this chapter Piketty pretends that it is. This is altogether not very Keynesian. He also notes that Britain had fiscal surpluses throughout this era. Piketty views this from the perspective of rentiers sucking wealth from the population in the form of taxes. In some sense this might be true — although I really doubt that interest payments on government debt were a key component of inequality in 19th century Britain, as any cursory reading of the history of the industrial revolution will confirm. But I suspect it is misleading in terms of the wider picture. In fact, Britain was very likely running a budget surplus in this era because, being the workshop of the world and penetrating colonial markets, it was running large trade surpluses (Piketty notes this elsewhere in the book but fails to make the connection). Update: Phillipe has kindly linked to a Bank of England paper in the comments section entitled The UK recession in context — what do three centuries of data tell us?. It provides us with the data on the current account and the public fiscal balance for this period. 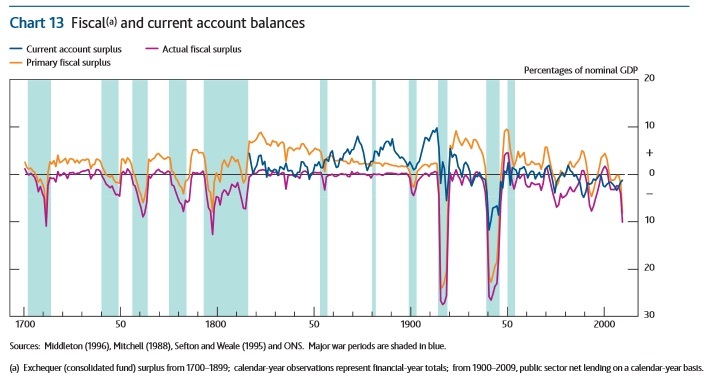 As can be seen from the graph below the current account was indeed in substantial surplus for the entire 19th century. This was probably the main component of the fiscal surplus, just as simple logical deduction would lead us to assume. At the same time the Industrial Revolution was roaring and the private sector was probably investing heavily. Thus it is not a big surprise that the government was running a budget surplus for much of the 19th century. After all, that is what the sectoral balances identity would tell us. And since unemployment was very low in this era the combination of a large export surplus and high domestic investment probably required the public sector to run a surplus. Yes, the tax could have been imposed on, say capital gains, rather than on workers, but come on… this was 19th century England! This sets the stage for the moral tone that Piketty takes with regards to the public debt for the rest of the section. He notes that it is inflation which kept the public debt levels down in the 20th century — even when they spiked after wars. He seems to equate this with the borderline hyperinflation initiated by the Jacobins and thinks of it as a sort of partial default. I think that this is deeply misleading. There’s lots of this sort of unsophisticated stuff in Piketty’s book. And it seems to me likely that this is because, in some ways, the book is a mess owing to a lack of a solid macroeconomic framework. I only take the example of public debt because I know that many of my readers will be all to familiar with this silliness and will be immunised against such thinking. The more I read Piketty the more I see him as synonymous with the Hollande government in France; proposing taxes at a time when these would ruin the economy while maintaining very mainstream opinions on the role of the public debt in the economy. Again, I like Piketty’s book overall but I really don’t think his macroeconomic credentials are up-to-scratch. This leads to a lot of silly sections and a lot of misleading interpretations. If you’re not fairly familiar with economic history and don’t have a good grasp of basic macroeconomic principles, I suggest that you handle this book with care. I suppose that warning would apply to the vast majority of working economists too. And for that reason I find it very unlikely that Piketty’s book will have much of a theoretical impact. Much more likely that various people will cast various contradictory interpretations of the accounting identities that Piketty refers to, rather grandiosely, as ‘laws’. Thus, Piketty’s should be seen as one of those books that will open discussion on a topic without much contributing to it. His accounting identities — like the r > g identity — provide a sort of blank screen upon which commentators will be able to project whatever theory they have concocted with regard to the cause of inequality. This will likely give rise to an academic industry ruminating on such questions — indeed, such already seems to be taking place and I think that it is the exodus of major figures like Krugman into this new land that has led to the media hype surrounding Piketty’s book (even academics do PR!). For those of us interested in the study of inequality this is wonderful. Although expect a debate that has been taking place behind the scenes in a very focused manner to quickly become filled with sludge as every would-be expert puts forward their little model explaining, in one fell swoop, the rise of income inequality while simultaneously handing us the silver bullet to rid us of it. This entry was posted in Economic History. Bookmark the permalink. Thanks a lot! Updated with a graph! Amazing that logical deduction and a bit of knowledge of history can tell you an awful lot even without sufficient data. Great stuff. Thanks a lot for that. Oh, you like Austrian wackos. Did you see the Twitter war between me and Jaitly? The guy is a clown of the highest order. @Bullionbasis Well I never said that's what I do. But I'm still not sure who this violent group are. Do they have a website? He seems to think that you’re a ‘mainstream’ economist, perhaps because you’re not a member of the gold cult or something. By his name I guess he might be Indian. There’s a lot of gold love in that country, largely for cultural and religious reasons I think. However, the rate of inflation in India is pretty high, so you can see why people might dislike “fiat money”. Those Socialists, and that society view. 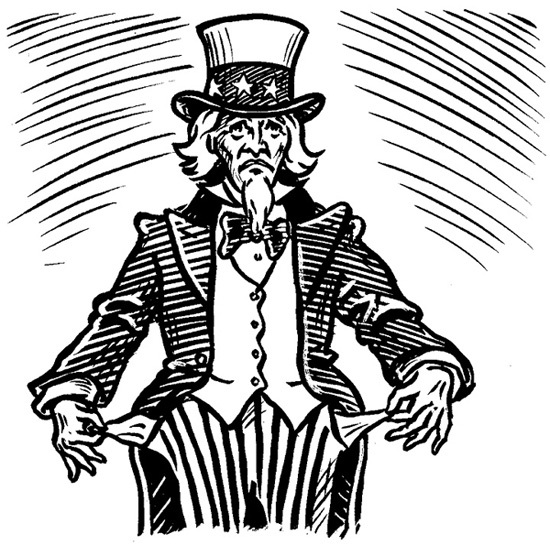 Any national government that issues certificates of indebtedness rather than issue debt-free fiat money to pay for anything needed for the public good is involved in a societal transfer of wealth (labor-income) in the form of taxation obligations for interest payments to the the holders of the financial assets issued by the borrower-Guv. It just seems pretty straight-forward as a political-economic reality. And this is wrong, why?